As much as I try to make homework time as peaceful as I can in our house, there will come times during the year when tears are shed and hair is pulled out. When this happens it’s time to go back to the drawing board and come up with creative ways to make homework time easier. Last year we were having issues with the boys losing homework papers and not being organized. They can also keep the notes for a specific assignment with the homework so that your child is less confused and won’t be asking ” Who can help me with my book report?” Sometimes they had homework that was due a week later, so it would sit around the dining room or get lost in the shuffle. After some stress over lost papers I had the brilliant idea of purchasing each child a Clipboard Case. I’m not sure what the official name of them is, depends on which store you go to. Some stores call them Clipboard Storage Cases, some call them Clipboard boxes or Clipboard Cases. You can find them in office supply stores and on Amazon. I love that each child uses their clipboard case to keep all of their papers in one place, and they can even use the clipboard as a mini desk if they like to work on homework in other places besides a table or desk. My kids find spots all over the place to have peace and quiet and work. I also love that all of the clipboards are kept in the art cabinet, so I don’t have notebooks, pencils, paper and folders strewn all over the house. It’s a great system for keeping our house tidier! 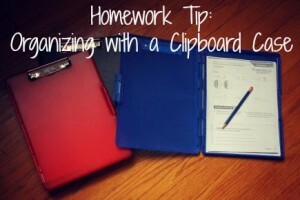 Does your child use a Clipboard Case to make homework time more organized? Do you have tips for making homework time easier? I’d love to hear them! 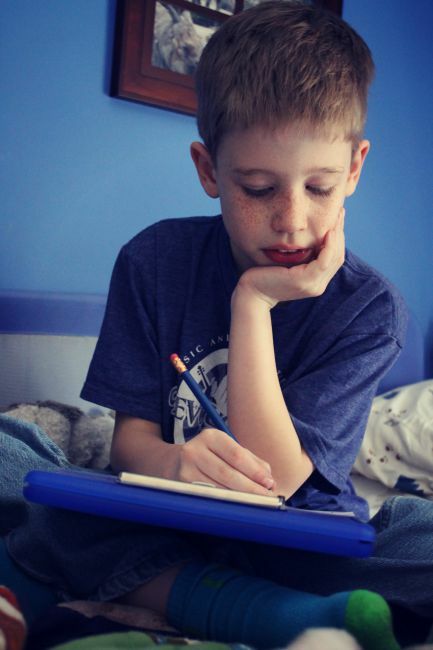 And check out this post I wrote a while back: Tips & Ideas for Peaceful Homework Time. Author’s Note: This is not a sponsored post, I just really love how these clipboards have made homework time more manageable at my house!